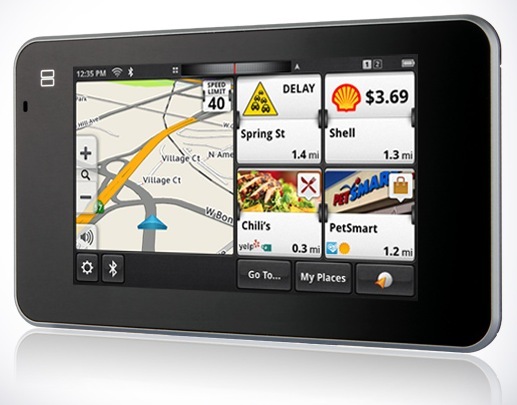 This review is brought to you by the fine folks at Magellan and the product at hand is the Smart GPS. 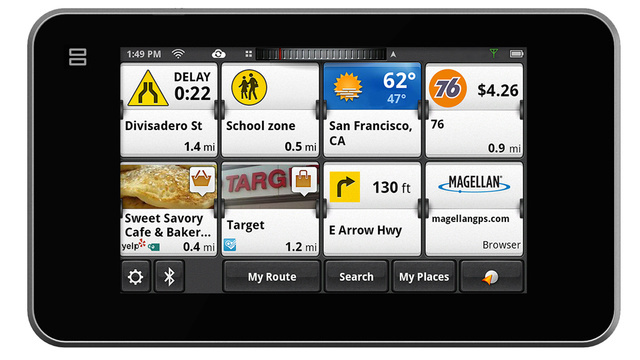 Being that most if not all smart phones have GPS, it was only a matter of time before GPS’ got smarter. This device not only will tell you how to efficiently go from point A to point B, it will also help you discover hotspots and coupons from Yelp and Foursquare based on your location and provides review without needing to pull out your phone. Speaking of phone, you are able to sync contact and locations with your phone or PC to take calls and quick entry for navigating. 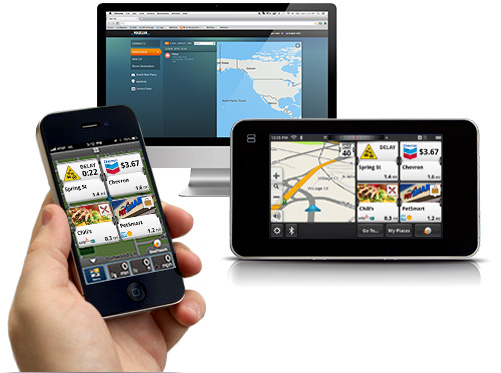 Dynamic Content is also available on the SmartGPS to show nearby Fuel Prices, Traffic Alerts, Red Light Camera Alerts, Best Parking and local Weather Updates. The screen was a good large size without being distracting from the road and even in the extreme heat of Arizona, I did not come across issues of the device not working due to overheating. The display was clear and all items were easy to read while resting on the dash and the dash mount docks the GPS easily and the charger slides into the mount so there aren't loose wires hanging. The dynamic content was the most intriguing feature to me, as after a long initial update I went on the road and used the split fifty fifty layout so I could have my bearings but see up to the date and fairly accurate location and direction headed, but at the same time local hotspots, traffic, and weather updates based on my location. The Bluetooth functionality was fast and connecting automatically made it so my phone never had to leave my pocket and could see the call information and access my contacts easily from the screen. On the other hand, if you have to use without access to the charger, make sure the battery is fully charged and you have a portable power pack because the battery only worked for about an hour before it would shutdown. The interface is also slow to respond and a bit choppy when moving in comparison to when I am using my iPhone to get me around Phoenix. Lastly, I would have liked to use the Roadmate On the Go app, but it is a large app, weighing in at 1.88 gigs, and I wiped all the music from my phone with 5 gigs of free space and I still got the message that I did not have enough space to install. 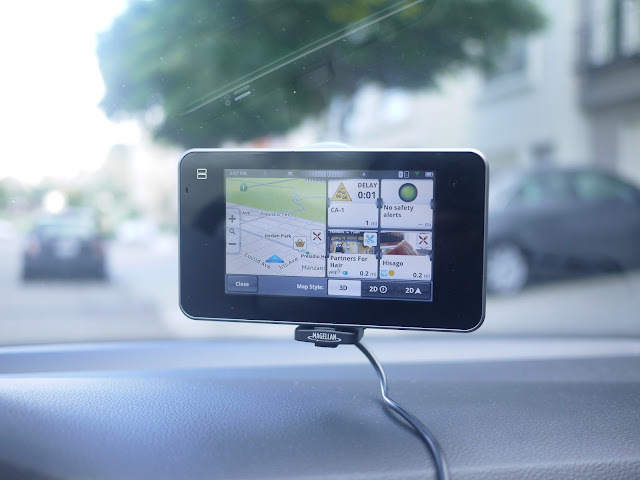 While, my time spent with the Smart GPS was not enough to replace my smart phone as my primary navigation device, the dynamic content updates were nice, helping me find some new dining spots and notification of surrounding traffic delays on my commute. The battery was my biggest issue, chargers are limited and tech is a plenty in my truck so if I had to choose the GPS or phone, unfortunately my phone wins everytime. 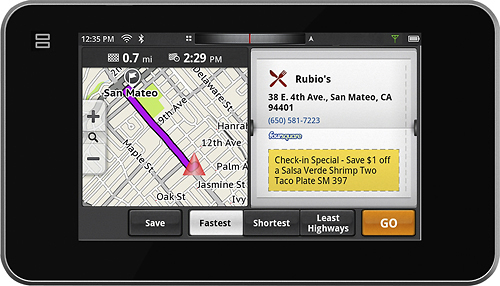 While it is hard to go up against phones that offer navigation for free, the Smart GPS did a fine job to stand out from other GPS devices on the market and if you do not have a current smartphone, then the Smart GPS is the navigation device for you and is available now for the price of $249.99.